Despite these amazing circumstances, many fans are already turning away from the collaboration, dismissing it as an underwhelming effort from the veteran French pair. Having listened to it countless times in the last 12 hours, we’d like to offer a different perspective in the form of 5 things we love about Daft Punk’s new collaboration with The Weeknd. The first thing to notice about the production behind “Starboy” is that it absolutely bangs. The song packs a beefy 808 underneath — the kind of pounding low-end rumbler that will shake club sound systems. Coupled with the pervasiveness of The Weeknd’s music, the song is sure to become an instant dancefloor staple in no time. With Daft Punk’s last album, Random Access Memories, in mind — coupled with The Weeknd’s penchant for disco — one might have expected this new collaboration to follow form and offer a cheery summer single à la “Get Lucky.” Rather, the mood of “Starboy” is moody, nostalgic, and poignant — a far-cry from the happy, celebratory tropes of RAM. From the distorted intro, to the brief instrumental beat that sets the stage for Abel’s crooning, “Starboy” is a nonstop thrill ride for the entirety of its 4-minutes. The bridge at 2:20 is short yet satisfying. In classic Daft Punk fashion, the song rises in layers and tension until the very last second, when it drops out to silence. Ultimately, it’s the kind of quick-paced, pop-savvy arrangement that begs to be listened to over and over again. 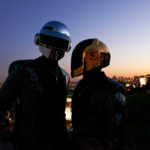 Daft Punk’s fingerprints are all over the production, even if not readily apparent upon a first listen. Take the harmonies, for instance, which populate the pre-chorus and chorus — their tonality is distinctly Daft Punk thanks to the subtle vocoding and distortion. The latter half of the track brings the most conscipous presence of the duo, with its growing saw wave pad progression — a slowly evolving harmonic layer that evokes the timelessness of Discovery. Every great pop song needs a memorable hook, and “Starboy’s” is instantly iconic: “Look what you’ve done/ I’m a motherfucking starboy.” The Weeknd’s signature falsetto brings the hook to a new level — such that even after the first few listens, the phrase is already ingrained into one’s brain. If that’s not a surefire sign of a successful hook, we’re not sure what is.